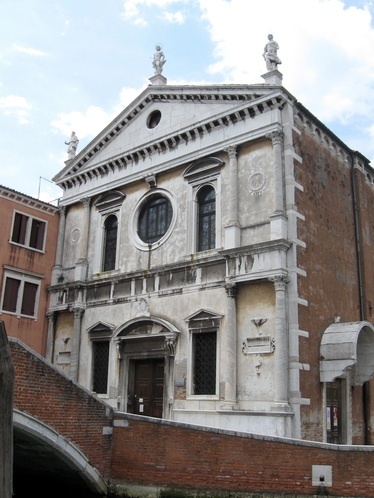 Built in 1505 by Scarpagnino to thank St Sebastian for delivering the city from the plague of 1464, this was the parish church of Veronese, who lived around the corner and according to legend, was given sanctuary here after murdering a rival over an affair of the heart. Thanks to its prior, who was also from Verona, he was given the chance early in his career to decorate it, which he did from 1555 to 1560 and in the 1570s, managing to create a thematically unified interior – and, this being Veronese, one that blurs the boundaries of art and reality. The ceiling, which Veronese painted after his first work in the sacristy, depicts the story of Esther in three panels: The Repudiation of Vashti, Esther Crowned by Ahasuerus and The Triumph of the Mordecai. The unusual Old Testament themes were used for their symbolic reference to the Virgin Mary. Vashti was the repudiated queen of Persia (Eve), Esther a Jewish girl chosen as the new queen (Mary), who helped to free her cousin Mordecai and his followers (redeeming mankind). The jewel-like colours (all recently restored—see the video, below) lend a glittering sumptuousness to Veronese’s monumental architectural perspectives and illusionism; note how he paints the central figures of each panel at an angle to get maximum sideways illumination (most notably the Mordecai, where the spectator’s angle of vision is from under the horses’ hooves). This ceiling, with the surrounding decorations added by his brother Benedetto, met with great success and brought Veronese his second commission, the wall frescoes in the upper choir with the Martyrdoms of St Sebastian. One of Diocletian’s centurions turned Christian, Sebastian survived his first martyrdom of arrows, only to rebuke the emperor and be martyred again, this time with blows. Don't miss the frescoed loggia, partially made from real stone and wood, and the archer, above one side of the nuns’ choir, shooting Sebastian – on the other side of the nave. Veronese designed the organ and painted its luminous panels; he also painted the altarpiece on the high altar, of the Virgin and Child in Glory with Saints, and the remarkable scenes flanking it in the choir, of SS. Mark and Marcellinus Led to Martyrdom and Comforted by Sebastian on the left and the Martyrdom of St Sebastian on the right. These are quintessential Veronese, full of action, stormy skies and big dogs, all done in magnificent costumes, set before a monumental, imaginary Rome. In the chapel to the left of the high altar, decorated in 1512 with blue and yellow majolica tiles from Urbino, are the tombs of Veronese (Paolo Caliari, d. 1588, with a bust) and his brother Benedetto (d. 1598). And more Veronese: a Crucifixion with the Three Marys at the Foot of the Cross, on the third altar on the right, set in an enormous monument designed by Sansovino for the Bishop of Cyprus. In the second chapel on the left, the Baptism of Christ is mostly by Veronese’s workshop, while the third altar on the left, the Virgin and St Catherine and Friar is believed to be one of his first works in Venice, as are the ceiling panels in the sacristy (door below the organ). Among the wall paintings here are works by Palma Vecchio, Bonifazio de’ Pitati (the ‘other’ Veronese) and Tintoretto (Punishment of Snakes). A few other artists managed to get their brushes in as well: the 83-year-old Titian, who used big brushstrokes to paint the altarpiece of St Nicolas (first on the right), and, near it, Paris Bordone’s dark and strange Jonah and the Whale. There was yet another Veronese, one of his first big banquet scenes, The Feast at the House of Simon, in San Sebastiano's monastery (now part of the University of Venice's department of Literature and Philosophy). Napoleon nicked it and put it in the Brera Gallery in Milan. San Sebastiano is a Chorus church.